The @SanMarcoTrain doing what it does best. And while we don’t usually report on individual twitter accounts, @SanMarcoTrain has issued a challenge to our own Melissa Ross that we couldn't resist sharing. For every retweet this slow train gets, its engineer has pledged to donate $5 to WJCT up to $500, with some stipulations that we'll leave to @SanMarcoTrain and @MelissainJax to argue over. Is there news value here? No. But our end-of-year pledge drive starts Wednesday so we figured why not play along. With that in mind, here are a few selected tweets from the tracks by the @SanMarcoTrain and @MelissainJax. 1. The San Marco Train has bested her at every turn. 2. She endorses our Make America Late Again platform. 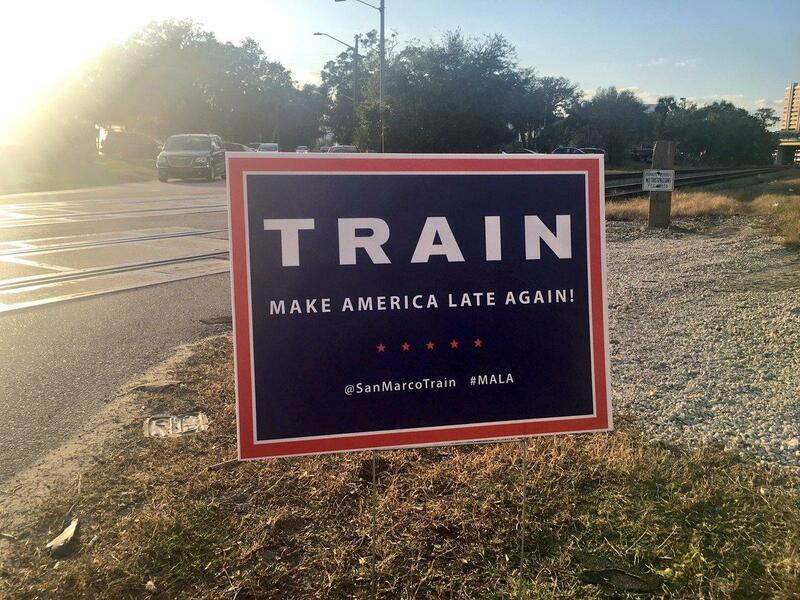 The San Marco Train is coming to #TrainTheSwamp and MAKE AMERICA LATE AGAIN. Are you ready to #MALA?! We shall spite with skill. When you hear our whistle blow then the "All a'bored signal" has been sounded. The irony of our Twitter conductor being late for a meeting this morning because of us is not lost on the San Marco Train. See San Marco? We play NO favorites. There's nothing like the smell of frustration in the morning.